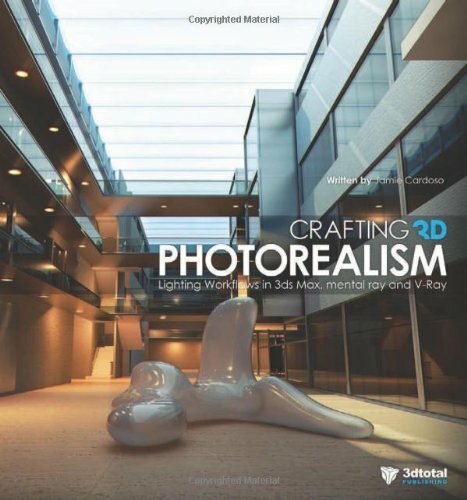 Crafting 3D Photorealism is for the intermediate and advanced users who are interested in creating materials, shades, lighting setups and renders. The software used is 3ds Max, V-Ray and Mental Ray. The files provided on the 3DTotal Publishing website can be opened with 64-bit version of 3ds Max 2010 or newer. While there are other 3d modelling software using the same render engines, to get the best out of the book, you should be using the same software so that you can go through all the steps in the tutorials. The book is quite advanced so you need to know your way around 3ds Max well enough. There are five chapters. The first covers the settings which involves creating materials and shaders, lighting and rendering in both Mental Ray and V-Ray. The next four chapters are detailed tutorials of architectural scenes, interior and exterior, day and night. Some of the lighting setups are quite complex especially when there are multiple sources. This is where the book is handy because it goes through them, making sure the lights are shining the correct way, glossy surfaces have the correct reflection, and the overall mood if just right. It also covers the post production which involves adding backgrounds, people, colour correction, spotting and tweaking visual anomalies. This book should give you some answers to how people are able to render the breathtaking architectural and interior scenes you see online. Author Jamie Cardoso is one of those people.